Reducing operating costs by saving energy is a concept that has moved from discussion to action in shipping. T he debate has been fueled by pending emission reg- ulations and options that may be an alternative to the use of high cost low sulfur distillates when op- erating in the emission control areas or in restricted ports. This quest for energy effi ciency has gone beyond “ECO” main engine performance, slow steaming or variable frequen- cies of motor and pump operations to reduce electrical load. Shipping is now diving deeper into effi ciency details with the use of LED lighting, computerized modeling of hull optimi- zation and further introductions of sophisticated hull coatings to assist those new optimized hulls through the water without burning fuel. Moving from sail, to steam and fi nally to internal combustion engine, shipping is now following the lead of the automotive industry and talking Hybrid marine power. At a recent industry conference, owners asked the major engine manufacturers how they could reduce their fuel con- sumption. There answer: “Don’t run your engine.” The argu- ably sarcastic reply, however, was right on the money. And, that is exactly what many Hybrid power systems are designed to accomplish. The defi nitions of hybrid marine power or hybrid marine propulsion describe main and auxiliary systems where power is supplied from more than one source. 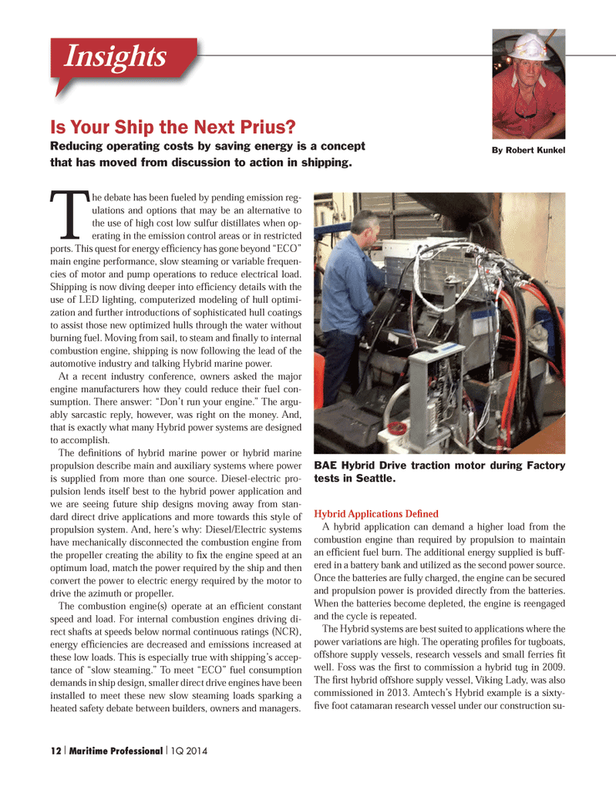 Diesel-electric pro- pulsion lends itself best to the hybrid power application and we are seeing future ship designs moving away from stan- dard direct drive applications and more towards this style of propulsion system. And, here’s why: Diesel/Electric systems have mechanically disconnected the combustion engine from the propeller creating the ability to fi x the engine speed at an optimum load, match the power required by the ship and then convert the power to electric energy required by the motor to drive the azimuth or propeller. The combustion engine(s) operate at an effi cient constant speed and load. For internal combustion engines driving di- rect shafts at speeds below normal continuous ratings (NCR), energy effi ciencies are decreased and emissions increased at these low loads. This is especially true with shipping’s accep- tance of “slow steaming.” To meet “ECO” fuel consumption demands in ship design, smaller direct drive engines have been installed to meet these new slow steaming loads sparking a heated safety debate between builders, owners and managers. A hybrid application can demand a higher load from the combustion engine than required by propulsion to maintain an effi cient fuel burn. The additional energy supplied is buff- ered in a battery bank and utilized as the second power source. Once the batteries are fully charged, the engine can be secured and propulsion power is provided directly from the batteries. When the batteries become depleted, the engine is reengaged and the cycle is repeated. The Hybrid systems are best suited to applications where the power variations are high. The operating profi les for tugboats, offshore supply vessels, research vessels and small ferries fi t well. Foss was the fi rst to commission a hybrid tug in 2009.